24TH YEAR OF HIS AGE. MARCH 2ND 1851, AGED 3[-] YEARS. THE FLOWER THEREOF FALLETH AWAY." I recognised the description of the accident, as it’s included in a book I’d been reading while researching my railwayman ancestors. "An inquest was held at Burton Salmon on Saturday on view of the body of Thomas Gowland, guard, aged 24, who was killed on Friday near the Burton Salmon station. It appeared from the evidence that the deceased was the guard of a coke train which was on its way from York, when it was overtaken by a short goods train from Milford junction. The driver and guard of the latter train were aware of its proximity to deceased’s train, and both trains were nearly at a standstill, when the goods train went slowly up to the other, with the intention of assisting to give it a start from the station. The coke train being, however, the more heavily laden of the two, and all the buffers being closed up, the engine of the goods train ran into the last carriage of the coke train, and caused it to bounce up, forcing it into the guard’s van. Deceased fell out of the van with his face downwards across the rails. He was conveyed to the station, and medical assistance was procured, but he died about two hours after the accident, one of his arms and his body having been dreadfully crushed. 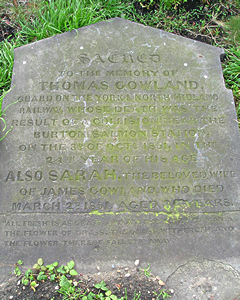 The jury returned a verdict of ‘accidentally killed.’ At the same time they considered that there had been some negligence on the part of the driver of the engine of the second train in not sounding his whistle on approaching the coke train, and they trusted that the melancholy result of this accident would prove a caution to railway officials generally for the future." York Civic Trust are looking to restore this in 2018 as part of our City Enhancement Programme!